The White Lemuroid Ringtail Possum is a miniature version of the polar bear; white, doesn’t like the heat and is struggling with the impacts of climate change. Climate change is the biggest threat for the possum. It is getting hotter and hotter, but there aren’t any cooler places for them to move to, as they are already as high up as they can get. Increases in temperature impact their ability to maintain their body temperature and reduce the places they can live. Heat waves are expected to increase in frequency under predicted climate change models thus putting these rare little marsupials in grave danger. This species has been particularly sensitive to the fragmentation of its habitat as, being a strictly tree dwelling species, it does not cross roads or powerline corridors that dissect its habitat. The lemuroid ringtail possum population has declined by as much as 97 percent in places where its habitat has become fragmented. We have to be honest – even we at Edge Pledge hadn’t heard of the White Lemuroid Ringtail Possum and we are animal-crazy! The reason is only 5 have been spotted in the world since 2005! They were thought to be extinct and were only rediscovered in 2009. They are particularly fussy and, even though they live in Queensland, they can’t cope in the heat. Temperatures above 30 degrees for even just a few hours will kill them because under extreme heat they are unable to maintain their body temperature. Their numbers were in the thousands when a severe heat wave hit the area in 2005, which all but wiped them out. This is why people are starting to compare them to the polar bear – where their habitat is shrinking because of melting ice-caps, the possum’s is shrinking because they can’t get to any higher mountain ranges where the climate is cool enough. They were the first known Australian mammal to be put on the brink by climate change. • $5,000; will fund a teacher to attend Wildlife of Australia’s Rainforest and share the experience with their school live from the field. • $10,000; will support logistical costs to expand the current research area to gain a more comprehensive understanding of the species. • $50,000; will purchase and install a series of trail cameras to monitor populations more effectively. That global warming is kept below 1.5 degrees, ensuring that these little guys still have a place to live at the top of mountains in Queensland and that we can extend suitable habitat for them. This will require help of all Australians! Earthwatch has partnered with the Centre of Tropical Biodiversity and Climate Change at James Cook University to conduct research on this possum and other threatened species in the region. The possums live in tall, moist, mature rainforest found in a far north Queensland on a single mountain range about 1000 metres above sea level – Mount Carbine Tableland in the Wet Tropics World Heritage rainforest, around two hours’ drive north of Cairns. There has been some computer modelling to predict where the possum could live if temperatures keep rising, but there is nowhere to go – which could mean that without our help the possum could be extinct soon. Like many Australian mammals, they’re nocturnal emerging at night to munch on leaves, fruits and flowers and sleeping all day in tree hollows. 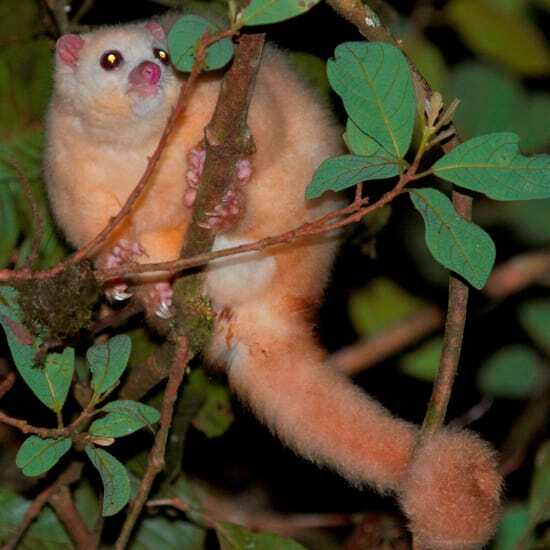 Similar to the squirrel glider, they use their gliding membrane to leap 2-3 metres from tree to tree. But they’re not exactly graceful – scientists often find them by simply listening out for the noise they make as they go crashing from tree to tree. They’re are social animals and are far from irresponsible parents– they raise their young together and they often live as a family in one den for up to a year after the children are born. The White Lemuroid Ringtail Possum needs you to help EarthWatch to get them off the edge.